This is what we did in my third grader's class for Valentine's this year. For food, we did ice cream sundaes with chocolate, vanilla, and birthday cake ice cream plus lots of toppings! (sprinkles, chocolate chips, chocolate syrup, cherries, crushed Oreos, m&m's, whipped cream, & marshmallows) Don't forget bowls, spoons, napkins, and drinks! For activities, we played 2 games, the kids exchanged Valentine's cards, and the teacher handed out awards for everyone's Valentine's boxes! It was fun! The two games we played were Valentine's Bingo and Heart Walk. I printed the Valentine's Bingo cards from HERE and used conversation hearts as markers. The Heart Walk was like a cake walk but on hearts! 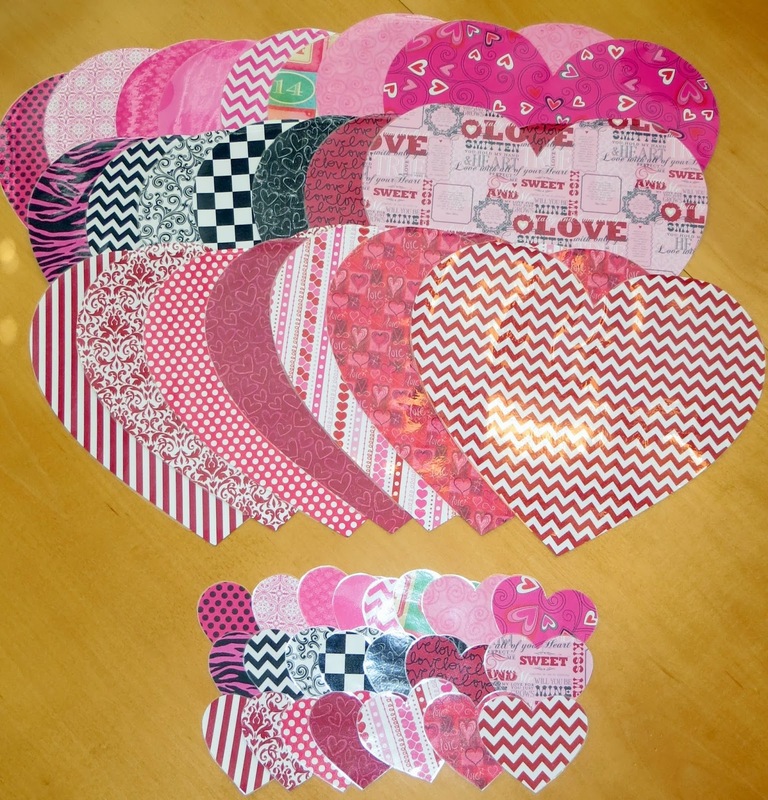 I cut big hearts & small hearts from many different pink/red/black/Valentine's scrapbook papers using my Silhouette. I also laminated them so I could use them again next year! I used masking tape to tape the big hearts to the floor in a circle. The kids all stood on a heart and walked around in the circle until I told them to stop and made sure they were all standing on 1 big heart. I then drew a small heart from a bag and the child standing on the heart with the same design was "out". The child would pull their heart up from the circle and give it to me and I would give them a prize! We did this over and over again until we were left with just a couple of hearts and a couple of kids. When I pulled the last small heart, that child was "out" and the last child standing was the winner! For the prize, I gave them all regular size Hershey bars that were wrapped in these adorable wrappers from It's Written on the Walls Etsy shop. The winner got a giant Hershey bar wrapped in a cute wrapper too! They had a lot of fun playing the game and cheering for their friends to win the giant candy bar! 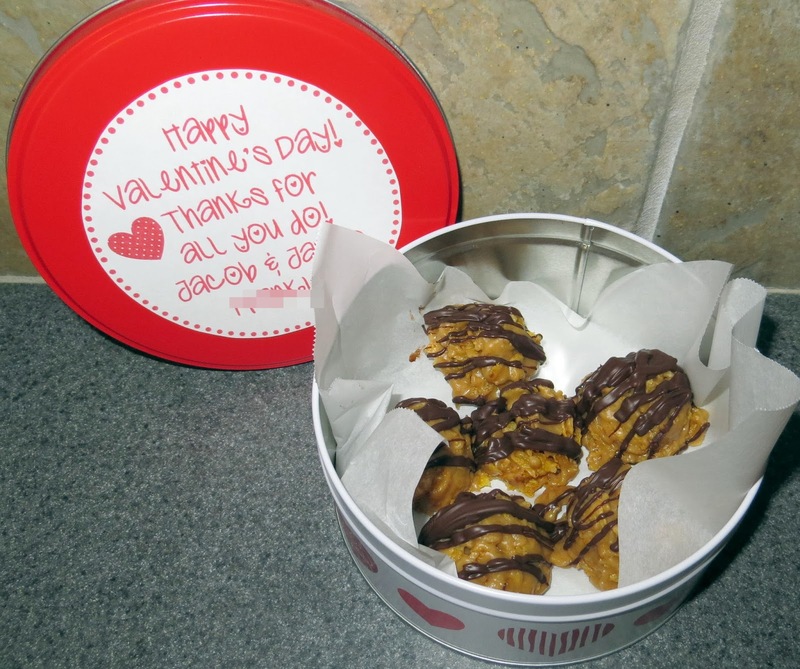 In addition, I made a little Valentine's treat for our teachers and administration. These cookies were really easy to make and so yummy! You can find the recipe HERE. I got the tins at Walmart and attached a tag to the top. You can download the tags HERE (I left room at the bottom to sign your name). Happy Valentine's Day!